Promotional Products play an important role in any tradeshow, expo, conference or marketing event. They are a product branded with your logo to be kept by the potential client for new business. The more useful the trade show item, the more likely that the product will be used after the event has ended. Goodgear provides many branded solutions for your next conference including printed tote bags, printed low cost pens and lanyards specifically sold for conference use and many more. The success of being remembered at your conference or tradeshow will be dependent on what you give your prospective clients and also how that product is given. 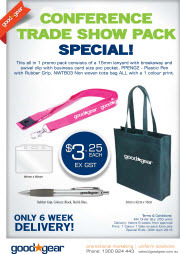 Call Goodgear today for more information on making your next trade show a promotional success.